Are you ready to be surprised, homify readers? Today’s feature dwelling takes modesty to a new level with an abode that includes a deceptively humble façade, with plenty of wonderful revelations hidden within. Conceived and planned by the team at Stage Y’s, this residence reconsiders the need or desire to be showy, and instead delivers a house that offers high quality finishes and an array of private features. 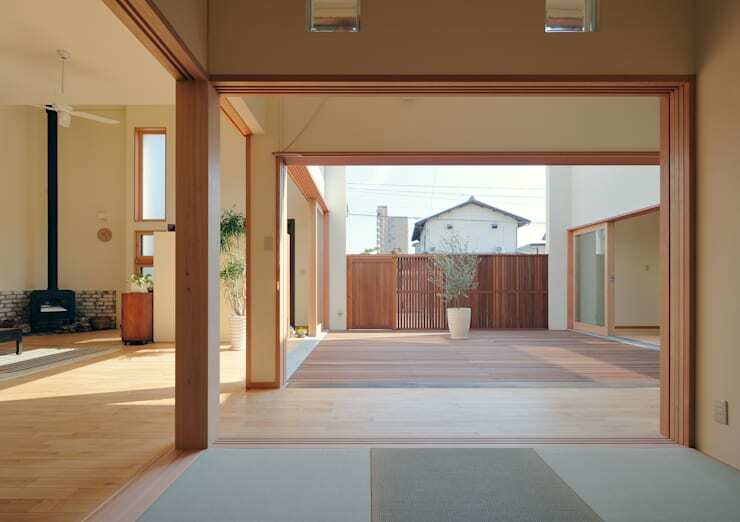 The ultimate in open plan living, the house incorporates large spaces that surround an internal courtyard. 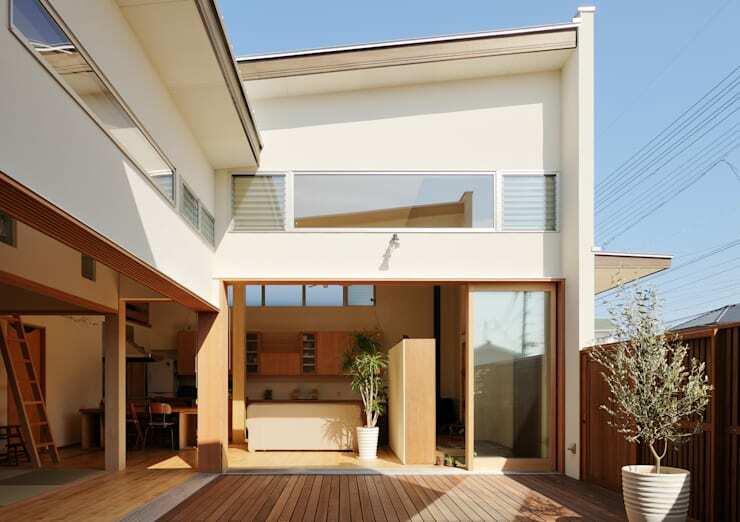 Modern, with a touch of tradition, the domicile includes many of the much-loved Japanese architectural features, which you will recognise and love. A perfect family abode, this large yet not overwhelming dwelling will stun you with its ability to feel open and roomy, while still embracing warmth and a sense of homeliness. 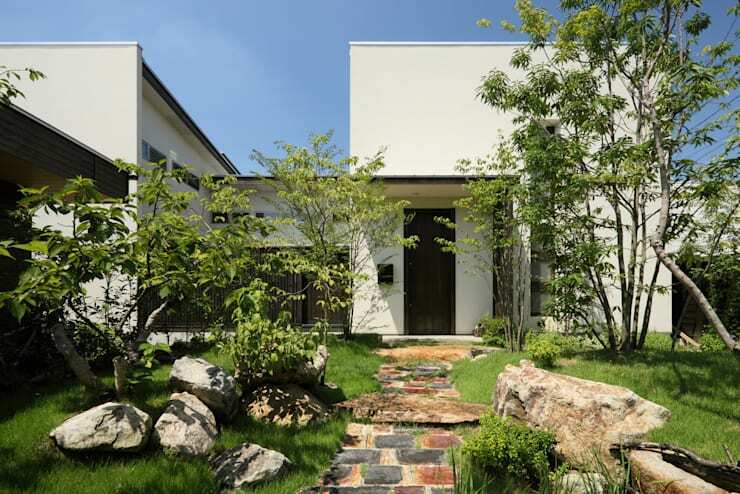 Set away from the street, amid a dense and lush collection of foliage, the dwelling is recessive yet still noticeable. Modern white stucco coats the outer fascia, in addition to contrasting timber doors, gates, fences and window frames. The building is U-shaped, two-storeys high and exceptionally private. Rather large, yet not imposing, the property is eye-catching, without drawing an unusual amount of attention to itself. Replete with timber finishes and an impressive aesthetic, this home is truly gorgeous. Our perspective from the terrace shows us the interior area of the living room, dining area and kitchen, while we additionally able to witness the large sliding glass doors that bring the outside ‘inside’ and offer a brilliant sense of flow. 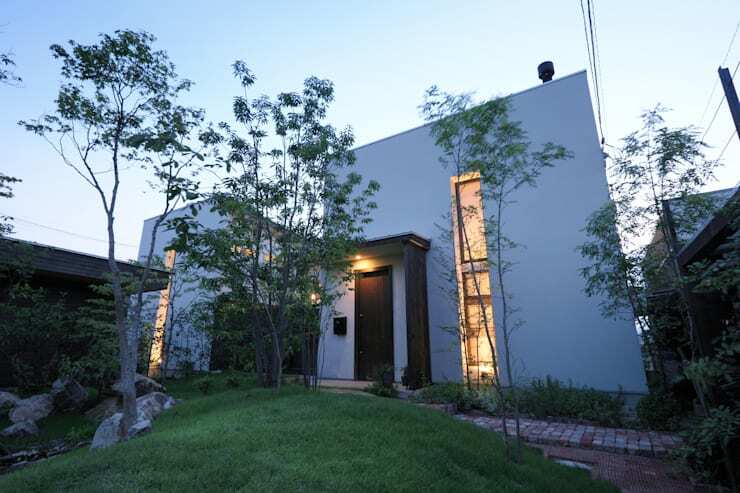 Comfortable and filled with natural light, this dwelling is angular and modern, without feeling cold or uninviting. Moving inside, we see that the architects have included extra high ceilings to offer an airy ambience and atmosphere. The kitchen is one of the most noticeable features in this living space, with timber joinery that matches the flooring and other architectural elements. Furthermore, we’re able to see the wood-burning stove that is situated in the corner of the room. Perfect for heating up the house on a cold or cool day, this is the central gathering point for the household and its occupants. Do you look at this room and see the perfect place to host a stylish and sophisticated event? We certainly do! One of our favourite vantages, this image truly shows how wonderfully open the house’s design truly is. 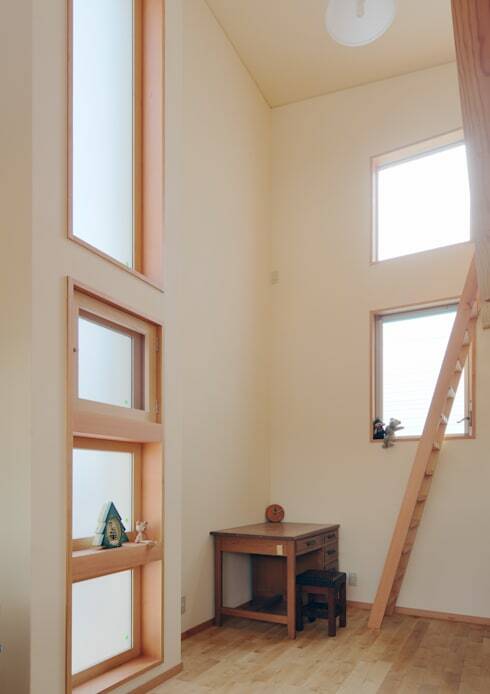 The room we are currently standing within offers traditional tatami mats, and screens that can be closed or opened depending on the need for privacy. Centred around the common timber terrace, this setup allows each room access to the outdoor area. Each space has been fitted with sliding timber and glass doors that ensure the home boasts clear movement, cohesion and flow throughout. Coming to the end of our tour, we take a look at the loft staircase that is situated in the corner of the room. The designers have ensured this space is perfect for storage or a child’s playroom, employing a flexible setup to maximise versatility. Next up, we check out the bathroom. 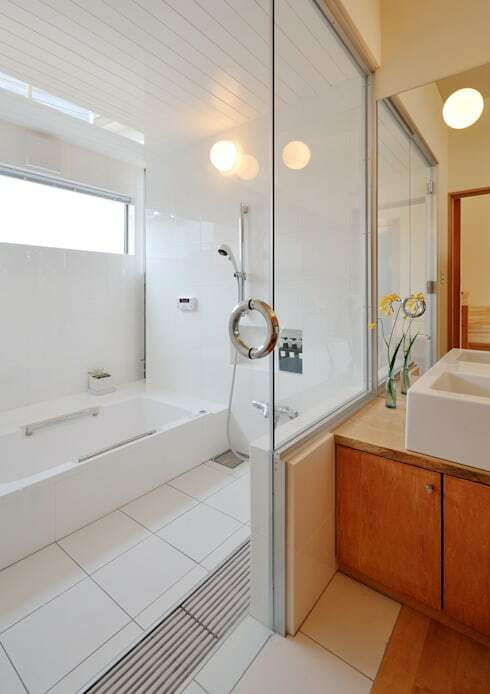 Feeling a little more like a luxury spa than a family wash space, this setup is complete with steam room, entry-level shower and gorgeous sunken tub. Last, but certainly not least, we take one final look at the house during dusk. Elegant and refined, this is one truly remarkable family home. The long vertical windows show us a slight glimpse inside the abode, but we’re well aware that the surprises and secrets lie behind the dark timber front door. 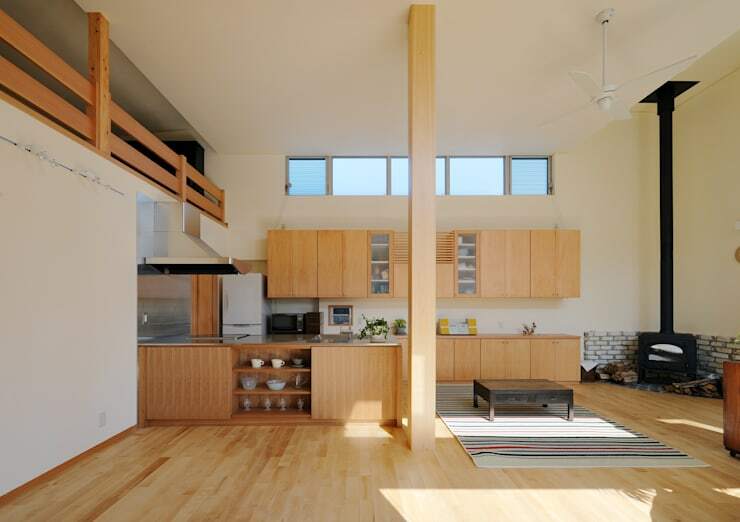 Are you a fan of Japanese interiors as much as we are?